This is everything you need to manufacture bullets in the .224 caliber (5.56 or 5.7mm, all standard 22's such as the .222, .220 Swift, .225, etc.) except lead and spent 22 cases. The weight range is adjustable from about 45 to 90 grains (with appropriate jackets). The rimfire case jackets you make with this set from fired .22 LR cases handle 45 to 60 grains, in various styles of open tip or FMJ. 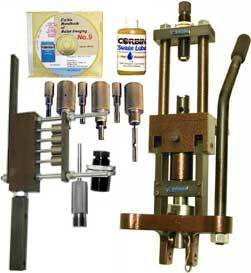 You can add a LT-1-S lead tip finishing die to make factory-perfect lead tips at any time. If you have been looking for a quick, easy way to get a complete package, here it is. This same package could be modified for other calibers, except the caliber specific items such as the RFJM-22S jacket maker would need to be replaced with other methods of jackets more suitable to the caliber selected. For faster operation, without melting scrap lead, you can add the LW-10 lead wire and PCS-1 core cutter listed elsewhere on this store. The shipping weight is greater because of the lead. Appropriate bullet jackets or jacket making die set. (The price will vary depending on the particular caliber and quantity supplies you wish to get with it, of course).